According to the fiscal year 2017 budget summary released by the mayor’s office in April, in 1978 almost 23 percent of New York City’s budget came from the federal government. During the late 1980s, that number was at roughly 11 percent. In 2015, the federal government provided slightly under 9 percent of the city’s total budget. Despite spikes in funding during catastrophic times like the September 11, 2001 terrorist attacks or the Great Recession, decline in federal investment in New York City is nothing new, nor is it purely partisan. While cuts have been made to federal funding for infrastructure, housing, health care, and other important city programs over the years, New York felt a particular sting when President Barack Obama announced in February a significant cut in anti-terrorism funding in his 2017 budget. Mayor Bill de Blasio, frustrated, traveled to Washington to testify in front of Congress to restore the full amount of federal money granted. In May of this year, Congress passed a Homeland Security bill, which included the original $600 million for the Urban Area Security Initiative, more than the $330 million proposed by the White House. Federal aid in the form of grants helps fund community development, social service, and education programs -- but who is in the White House and party control in Congress have a great deal of influence over amount of such funding. New York City’s current fiscal year 2017 budget is about $82 billion, less than one-tenth of which comes through federal funds. In 2013, New York City taxpayers sent $57.3 billion in federal income tax to Washington, according to the Observer, which reported in March on federal disinvestment in New York. According to the city’s Independent Budget Office, the top three city agencies that received the most federal aid from 2011-2015 were the Department of Education ($8.4 billion), Human Resources Administration ($7.7 billion) and the Administration for Children’s Services ($6.4 billion). The fiscal needs of big cities like New York sometimes get short-changed in D.C., explained Jonathan Bowles, executive director of the Center for an Urban Future, an independent policy group focused on improving New York City’s economy. Some also point to cities, especially New York, being seen as economic engines not in need of federal support -- saying that leaders in Washington see New York City more as a booster of federal coffers through tax revenue. Bowles said the next presidential administration has a real opportunity to include urban areas in new budget proposals, after decades of ignoring them. 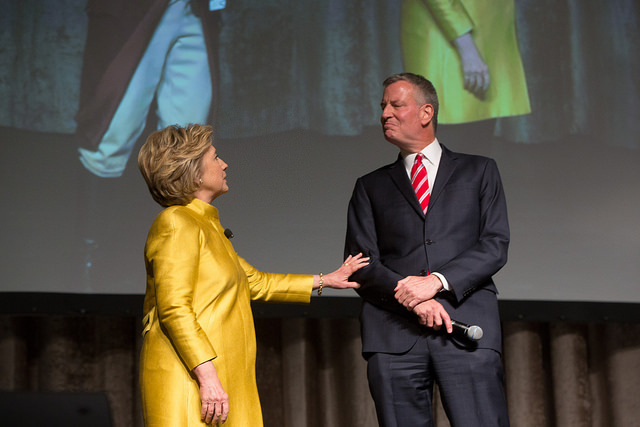 Over the past year, Mayor de Blasio has campaigned for Hillary Clinton, his fellow Democrat, on numerous occasions and in a variety of states (this, after he delayed his endorsement of Clinton). De Blasio dedicated his time to campaigning for Clinton instead of stumping for Democratic candidates in key New York State Senate races, where control of that chamber will be decided. In 2014, de Blasio and his allies attempted to swing seats to ensure a Democratic takeover of the last Republican stronghold in New York statewide government. The effort failed and “Team de Blasio” is under investigation for some of the fundraising tactics it used. De Blasio said he is focusing on the federal election this cycle, and in part doing so due to the large stakes at play for New York. “[This election] will decide the presidency, it will decide the future of the Senate, maybe even the House, but it’s also going to reset the American political dialogue,” de Blasio said at a press conference when Gotham Gazette asked why he was choosing to be involved in the presidential race but not state Senate races. Key pieces of de Blasio’s agenda have been limited or blocked by Senate Republicans in Albany. “I think it’s some of the time that’s going to be best spent in the next few weeks because if it helps us change the trajectory of the country and the federal government, that’s going to help New York City in a very big and very material way,” de Blasio said of campaigning for Clinton. At other times, de Blasio has acknowledged that he is staying away from the state Senate races because of the “atmosphere” of investigations into his team’s 2014 tactics. Most federal policies impact New York. According to E.J. McMahon, research director at the Empire Center for Public Policy, the outcome of congressional races may affect New Yorkers more so than who becomes the country’s next president. As the city’s economic relationship with Washington continues to decline, city officials seek a presidential administration that would resurrect the stronger partnership it once had. Policy and funding are the two key areas, and they are usually linked. Federal policy on immigration, education, health care, and other key areas greatly affect what New York City does -- and there is a great deal at stake in the presidential race in terms of different policy visions. The same goes for those who might control each house of Congress. In terms of additional funds from Washington, the city is looking for increased aid for bridges, tunnels, and roads; money toward jobs programs and housing vouchers; and more. While it is not completely clear how a Clinton or a Trump presidency would differ for New York City -- and control of Congress may come into play significantly -- the two major party candidates have outlined different visions on the overall role of the federal government, as well as on trade, immigration, the minimum wage and a variety of other policies. Dr. Bruce Berg, a political science professor at Fordham University, said there are three levels on which to assess the candidates’ plans and their potential impact on New York. These include each campaigns’ intended agenda, which party controls the House of Representatives and the Senate, and the candidate’s relationship with the mayor. Berg says the issues most at stake for New Yorkers in this election include infrastructure investment, immigration reform, healthcare, and public housing. Prioritizing investment in the nation’s infrastructure may be the biggest area of agreement for Clinton and Trump. The aging roads, bridges, and water systems of the United States are deteriorating; government data show in 2014, 32 percent of roads were rated “poor,” up from 16 percent in 2005. During a recent U.S. Conference of Mayors event in Manhattan, Mayor de Blasio said 160 bridges in New York City were built over 100 or more years ago. The average lifespan for a bridge remains about 40 years. Despite being the tenth largest economy in the world, attracting more and more residents and tourists to the city each year, New York City’s aging infrastructure needs a serious upgrade, according to the mayor, as well as many others. And it’s not just New York, de Blasio explained at the USCM event, but cities nationwide that are losing funding for infrastructure projects. Although both Clinton and Trump agree the nation’s infrastructure is crumbling, their plans to pay for related projects differ dramatically. If Hillary Clinton wins the election, her first-100-days plan includes investing $275 billion to rebuild the country’s infrastructure. This includes investing in roads and bridges, but also in water systems, increasing wide-accessibility to internet, and improving the rate of completing these projects. Former Mayor of Philadelphia and Governor of Pennsylvania, Ed Rendell, a Clinton surrogate, said Clinton’s investment will be over five years and paid for through business tax reforms, including a one-time tax for corporations bringing profits held overseas back to the U.S. She hopes to allocate $25 billion over five years to a national infrastructure bank, which would fund projects that become held up due to political inertia in Congress. According to Rendell, Clinton also hopes to reauthorize the Build America Bonds program, which would finance infrastructure projects entirely from the federal government. “It will bring jobs, growth, improve infrastructure, improve public safety, improve our quality of live and make us more economically competitive,” Governor Rendell said about Clinton’s plan at the Conference of Mayors event. Calling it “America’s Infrastructure First,” Trump also plans to invest heavily in infrastructure. His plan includes spending $1 trillion over a decade. He says he will pay for this plan not by raising taxes, but instead through private companies by offering a tax credit. While one-sixth of a project’s cost would be funded privately, government-issued bonds would cover the rest. Trump’s proposal, the details of which were released two weeks before the election, would take advantage of low interest rates and encourage construction companies to spend on road and bridge projects that have revenue attached. These include toll roads, toll bridges and airports. This way, according to Trump and his advisors, the plan will pay for itself. Approximately 37 percent of New York City’s total population is foreign-born. Making up roughly 43 percent of the city’s total workforce, immigrants significantly contribute to the city’s economy. The immigration policies under the next President and Congress will greatly impact the city’s immigrants, half a million of whom are undocumented, as well as prospective immigrants, both documented and undocumented. Alisa Wellek, the executive director of the Immigration Defense Project, a nonprofit, said New York has long been considered a target for deportation and detention of immigrants by Immigration and Customs Enforcement (ICE), a federal agency. Within her first 100 days as President, Clinton plans to create a pathway to full citizenship, defend President Obama’s executive actions of DACA and DAPA, which extended the amount of time immigrant children and their parents can stay in the country, access to healthcare for all immigrants, and end corporation-owned, private immigration detention centers. During the final presidential debate, Clinton discussed how she would enforce immigration laws. “I don’t want to rip families apart,” Clinton said. “I don’t want to be sending parents away from children. I don’t want to see the deportation force that Donald has talked about in action in our country,” she said. Clinton also said she wants to bring undocumented immigrants “out from the shadows” and into the economy in order to protect them from “exploitative” employers and wage theft. Since the beginning of his campaign, Trump’s top issue has been illegal immigration. His plans include building a wall at the country’s southern border, paid for by Mexico, ending sanctuary cities, and creating a “total and complete shut down of Muslims” from entering the country. He has spoken unclearly about what a “shut down” actually means, referring to “extreme vetting” of potential migrants and refugees, and saying the ban would not be on Muslims, per se, but on people leaving certain areas of the world where ISIS is most active. In New York City, the Muslim population continues to grow and estimates range from 600,000 to 1 million individuals. Trump’s plan to create a database of Muslims living in the United States and ban them from entering the U.S. could potentially have significant social and economic effects, though the specifics remain unclear. It is also not clear whether these measures would enhance national security. Wellek said she hopes the next administration will overhaul the immigration system by repealing the 1996 immigration laws, ending mandatory deportation and detention and aligning reforms made in the criminal justice system with the immigration system. According to Wellek, New York has recognized the role immigrants play in the city. What Wellek is referring to is a decision by Mayor de Blasio and the City Council to cooperate less with ICE. Indeed, many elected officials from the city, which is dominated by Democrats, have spoken out against Trump’s immigration agenda and said that it would be especially harmful to New York. Since it’s inception, President Obama’s Affordable Care Act (ACA) has helped decrease the number of New Yorkers lacking health insurance by 2.5 percent, from 12.6 to 10.1 percent uninsured. Despite data showing this success, uninsured patients still makeup about 70 percent of stays at public New York City hospitals, Health + Hospitals, which is very costly to the city. Some of these patients are undocumented immigrants who were left out of the ACA, but still use public hospitals. This, along with soaring costs and declining revenue, has New York City’s public hospitals in financial crisis. Health + Hospitals is projected to have an operating deficit of $1.8 billion by 2020. The candidates’ two very different healthcare reform plans have the potential to affect the future of healthcare in New York. Like most Republicans, Donald Trump disparages the ACA, or Obamacare as it is often known, and Trump plans to eliminate and replace the ACA on day one of office, he says. He called Obamacare “a big fat, horrible lie” and a “catastrophe” -- criticism that has received some boost given recent news about rate hikes under ACA exchanges. Trump has not explained exactly what he would replace it with, but promises something “far better” and cheaper, and has said the country must eliminate “the lines” that restrict how insurers can sell health insurance state by state. Trump wants to transform Medicaid, the federal healthcare program for the poor, into state block grants. If elected, Hillary Clinton plans to preserve the ACA and attempt to expand coverage for those that do not currently qualify for health insurance under the law. This means expanding Medicaid in every state, lowering health care premiums, and providing citizens a public-option insurance plan, which Clinton hopes to push states to offer their residents. A public option could insure over 400,000 people in New York who were left out of the ACA. If Republicans continue to control the House of Representatives, this expansion of the law has little chance of passing Congress. Clinton also said she wants to double the funding for primary care services at community health centers over the next ten years, which would increase access to health care for many underserved, low-income, and uninsured New Yorkers. According to her campaign website, she also wants to “expand access to affordable health care to families regardless of immigration status by allowing families to buy health insurance on the health Exchanges regardless of their immigration status” - a move that could have drastic effects in New York City given the financial issues at Health + Hospitals. As the largest public housing authority in the country, the New York City Housing Authority (NYCHA) currently serves about 600,000 New Yorkers, including Section 8 voucher holders. Based on the July 2015 Census, 4.7 percent of the city’s population lives in public housing. No new public housing buildings are being constructed and New York is one of few places in the country that has committed to keeping its public housing stock. At the same time, federal funding for NYCHA has shrunk considerably, with the federal government moving more toward housing vouchers, which are used at some NYCHA facilities. The de Blasio administration has invested considerable additional funds into NYCHA, but the authority is also in serious financial trouble. 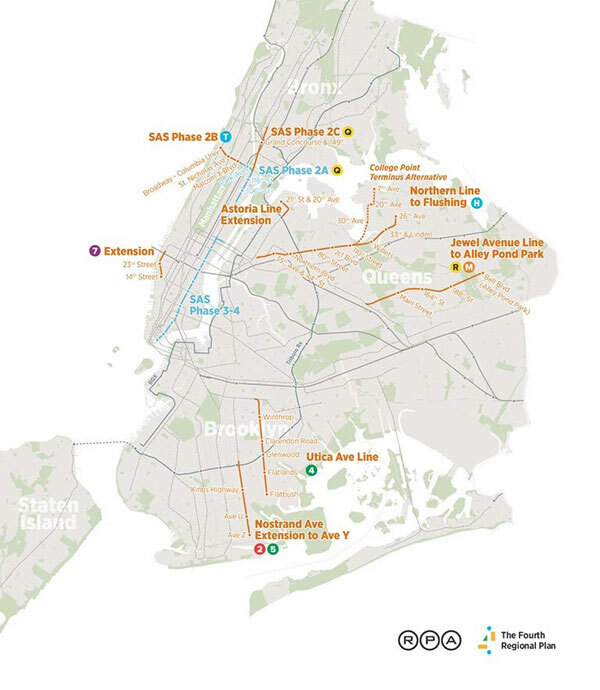 The mayor launched a 10-year plan titled NextGeneration NYCHA, which includes a variety of initiatives, one of which is a program that leases underutilized land to developers to build both affordable and market-rate housing. This plan hopes to combat the decline in federal funds dedicated to public housing, especially after NYCHA’s expected deficit jumped from $25 million to $60 million in 2016. NYCHA has struggled to meet basic maintenance and operation costs, though it has instituted several new reforms to improve the situation. Bowles, of Center for an Urban Future, said that Congress has not increased funding for housing projects in New York and other major cities for decades. Public housing is one piece of the overall affordable housing picture. Despite being a major issue for most cities nationwide, tackling affordable housing and the cycle of poverty never became a major focus during this presidential election. In September, Clinton wrote an op-ed in the New York Times addressing housing. Clinton calls for expanding Low Income Housing Tax Credits in areas of high-cost to create more affordable housing in viable neighborhoods. Trump, a real-estate mogul, has released no specific plan to address affordable housing and nothing on his campaign website mentions it. However, the Republican Party’s platform calls for “responsible homeownership” and giving more control over zoning procedures to local authorities, rather than from the federal government. The relationship between the Mayor of New York City and the next president is important, as is the next president’s commitment to urban issues. Additionally, the makeup of Congress and the major funding decisions regarding aid sent to cities remains of utmost importance. If Democrats are able to retake control of the Senate, New York Senator Charles Schumer is likely to be Majority Leader, which could be a boon for New York. Despite a long relationship with Clinton, including managing her 2000 campaign for U.S. Senate, de Blasio waited months after Clinton announced her presidential candidacy to endorse her, wanting to push her more to the left on issues. In recently hacked emails, the Clinton campaign expressed annoyance with de Blasio, jokingly calling him a “terrorist.” Donald Trump has called de Blasio “incompetent” and the “single worst mayor in the history of New York City,” but has praised the mayor after he was elected. In part due to obstruction by congressional Republicans who want to see less government, President Obama has issued over 250 executive actions to get around legislative gridlock. Bruce Berg of Fordham University says if Clinton wins the presidency, she may face similar barriers to getting laws passed in Congress, which would affect federal aid granted to New York City and elsewhere.